Why not, Feng Shui is all about balance and harmony, and both are important in order to have a good looking scrapbook page. In traditional Feng Shui, you balance these elements in your life by increasing (or decreasing) their strength in the appropriate areas of your home. For example, if the entrance to your home is badly placed, you can affect this area with the appropriate elements — such as a water feature or a sculpture to balance the overabundance of another element (or "bad chi" which is usually caused by an obstruction or poorly placed local feature). How Does Feng Shui Relate To Scrapbooking? In scrapbooking, Feng Shui elements work somewhat differently. Here, the various elements can create a harmonious portrait of the subject, balancing character traits and life habits. As you can guess, this is very appropriate for personal scrapbooking. You can create a page that helps identify and strengthen those elements that you need in your life, and then display the result in the appropriate area of your home. For example, if you want to grow your business through committed effort and drive, fire and metal would be helpful. Therefore, you would use red cardstock as a background (for fire), add metal elements to the page, and display your finished page in the areas of your home that you have identified as the career or wealth sectors. For family peace and harmony, create a beautifully balanced page for a family portrait and place it in the area you have identified as the family sector of your home. This is the element that "grounds" the others. The colors of earth are literally the colors of the earth: brown, gray, terra cotta and so on. Earth elements are pottery, statuary, rocks — so think mosaic pieces, clay medallions, semi-precious stones, and so on. EK Success makes a wonderful range of vintage stone accents that you can use on scrapbook pages, but found objects such as pebbles will also give an earthy feel to your layouts. The common shape for earth is square, so bear this in mind when cropping and matting. This is the most obvious of the elements. The colors are metallic, silver, gold, bronze, copper, and so are the embellishments. It’s a very strong element; a little goes a long way, so don’t overdo it. Look at some of the wonderful metal embellishments available, such as tags, paper clips, brads and seals. Making Memories has some beautiful metallic mesh, frames and words that will bring the element of metal to life on your pages. The shape for metal is round and dome-shaped. At first glance, this might seem odd for scrapbooking, but wood can be introduced in many ways. Wood represents Spring, and new life. As such, it is an ideal element for Easter scrapbooking. Many of the elements you will use for Easter are appropriate for wood. The color for wood is green, in every shade, and embellishments can be taken straight from nature – pressed flowers and leaves, tiny pieces of bark. Wood is an important element in Feng Shui as it affects family and health. You can buy some lovely nature-inspired wood embellishments, or you can go on nature searches or enjoy beachcombing to find your own. The shape for wood is cylindrical and tubular, so you might like to include arts such as quilting into your pages. This is the very `yang’ element, signifying energy and drive. Too much can be way too much, so just use it as a background (red cardstock) or as carefully placed embellishments. The color for fire is naturally red, so check out the beautiful range of papers available at your scrapbooking store for some inspiration. 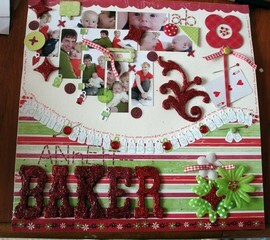 And you can find a number of red colored embellishments to add just the right "pop" for your page. The shape for fire is pointed, like a flame, which you may want to incorporate for Fourth of July or fireworks scrapbook page. This element is essential to life, but for obvious reasons can be difficult to incorporate into scrapbooking. The usual way is by some water feature in the image itself – the ocean, a waterfall, a river. Pearly vellum, sheer ribbons and other fabric embellishments, as well as clear acrylic, also make nice "water features". The best color for water paper and embellishments is a pale, translucent blue or jade. The best script to use is a flowing cursive, and the shapes for water are irregular. Feng Shui is a very rewarding study, and you are bound to find many ways to incorporate the 5 elements of Feng Shui into your scrapbooking. Some designers have already produced designs for scrapbooking with Feng Shui elements, it’s an area of design that is still wide open to interpretation and your own experimentation, so have fun!